CONSTRUCTION URBANIZE IN FULL COLOR RELY ON THE GLOBAL LEADER FOR INORGANIC PIGMENTS PAINTS & COATINGS We produce pigments that give color to materials such as concrete, roofing tiles, pavers and asphalt. Synthetically produced inorganic pigments are available in different delivery forms: powder, micronized powder, granules and compacted pigments. Our color spectrum ranges from yellow to orange, red, brown and green to black. Colors that stand the test of time The high tinting strength of Bayferrox ® and Colortherm ® pigments imparts a permanent, aesthetically pleasing appearance to construction materials. Exceptional lightfastness properties and weather stability help them to withstand various climates in all regions of the world. Local technical service n Pigment testing according to EN12878 n Strength testing of pigmented concrete n Color adjustment, matching and formulation n Determination of solar reflectance n Hands-on educational training, like our Bayferrox ® Color Workshop As the urbanization megatrend continues to build, and emphasis on aesthetics continues to grow, you need a reliable pigment specialist with industry-specific expertise. 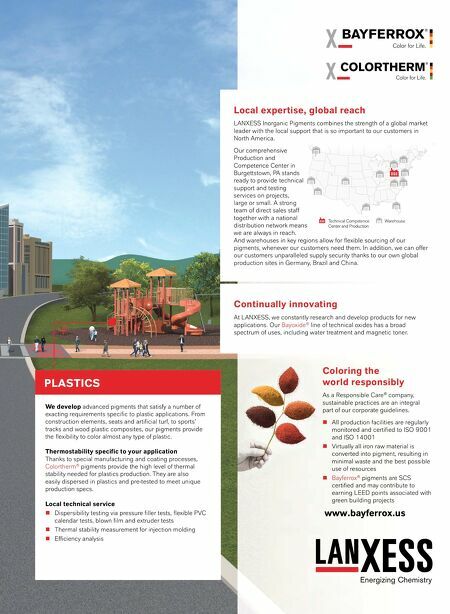 LANXESS Inorganic Pigments helps to create colorful living environments on a sustainable basis. Nearly 90 years of experience in iron oxide and chromium oxide pigments distinguishes us from the competition and enables us to add significant value for our customers. Thanks to a strong local footprint in the North American market, including a dedicated and experienced technical service team and robust sales and distribution network, our customers have a capable partner on their side. Discover our broad solution portfolio, and learn how product quality, technical know-how, service and sustainability combine to offer unique value. We understand that color pigments for coatings must fulfill the highest performance requirements. 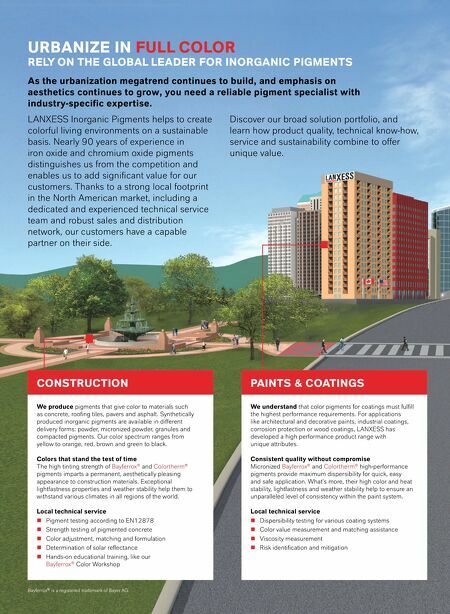 For applications like architectural and decorative paints, industrial coatings, corrosion protection or wood coatings, LANXESS has developed a high performance product range with unique attributes. Consistent quality without compromise Micronized Bayferrox ® and Colortherm ® high-performance pigments provide maximum dispersibility for quick, easy and safe application. What's more, their high color and heat stability, lightfastness and weather stability help to ensure an unparalleled level of consistency within the paint system. Local technical service n Dispersibility testing for various coating systems n Color value measurement and matching assistance n Viscosity measurement n Risk identification and mitigation Bayferrox ® is a registered trademark of Bayer AG.